My dad picked up a very small tortoise/turtle while he was on his run. It's about 1.5 inches total, and maybe has an inch long shell. It has a little bit of white on the tip of its nose/beak. What kind of turtle/tortoise is it and what do you think we should do? It seems to be moving awfully slow, we think slower than any of them normally move. 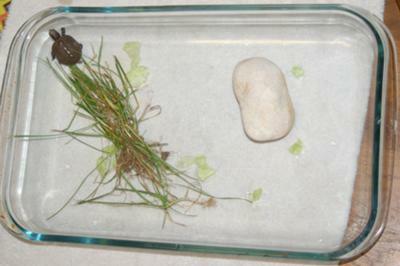 We have him in a big pan with a rock, some lettuce,some grass, and some water. My dad says we should nurse it back to health, and i especially like this idea because I have never had a pet. But please help us with what would be best for the turtle.